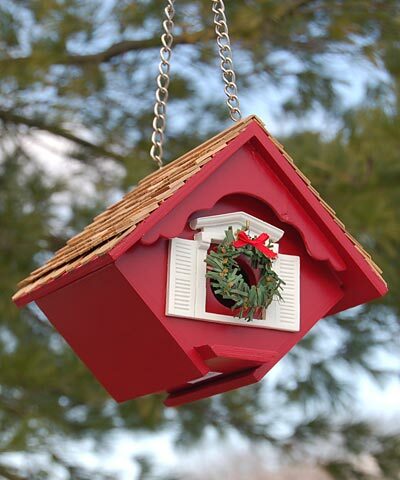 Bring a cheerful, yuletide hint to your home or garden using the Home Bazaar Red Holiday Little Hanging Wren House. The bold color, realistic detailing, and unique shape make this unit a charming addition to your garden or home in moments. Its diamond-inspired shape is perfect for housing wrens or chickadees, and also adds a fun silhouette to your home decorating. A 1.25" diameter entry hole rests at the front of the piece, flanked by faux white shutters, and a fabric wreath hangs here as well for a bright holiday theme. A pitched, shingled roof completes the home, protecting nestlings from rain, and ventilation slots beneath the overhang aid in regulating the internal temperature. The bottom panel of the home is removable for seasonal cleaning, and the attached chain makes hanging the item simple. Place a wonderful, seasonal adornment in your home or yard with this Red Holiday Little Hanging Wren House. Note: Climate and the elements will weather this home and change its appearance over time; however, weathering will add to the house's natural charm without compromising its function. Should you want to preserve the finish (paint) of this item, you should select a polyurethane product that is recommended for marine use (UV Rated) that will not turn the white paint yellow. You should expect that once left outside, the house will weather and require refinishing. Remove the fabric wreath for outdoor use. Stokes Multi-Position Wall Bracket, Black, 18"